If you are interested in learning more about this program, with no obligation, fill out the form below and we will have one of our Exchange program representatives personally reach out to you. You can also give us a call at 877-465-0829 or just stop by to set up a quick and complimentary Exchange Evaluation. At McCarthy Olathe Hyundai, we never seek to overburden your budget or take the wind out of your car-shopping sails. Instead, we offer top dollar for your trade-in, allowing you to filter searches by vehicle, not price. We believe that buying a new ride should never be an added stress, especially if you've got a highly valuable asset already sitting in your driveway. 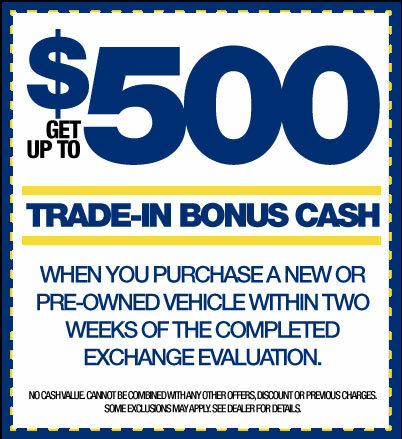 In As Little As Five Minutes, You Can Go From Wondering To Knowing How Much Your Trade-In Car Will Net You. So, Don't Take A Guess On Your Used Car's Value-Let Us Do The Heavy Lifting For You. Submit Your Contact Information, Including A Valid Phone Number And Email Address. Don't Worry-We Only Use This Information To Contact You Regarding Trade-In Estimates. For The Most Accurate Trade-In Estimate, Include Any Pertinent Information About The Vehicle's Optional Equipment, Accident History, And Title History. Once We've Received Your Submission, We'll Review Market Values, Compare Prices, And Contact You With A Free Estimate. From There, You Have No Obligation To Trade In Your Vehicle At Our New Hyundai Dealer Near Kansas City. We Will Take Your Information, But We Will Not Take Your Freedom! To see how much your used car is actually worth, fill out and submit this trade-in form for a quick and accurate estimate of its value. 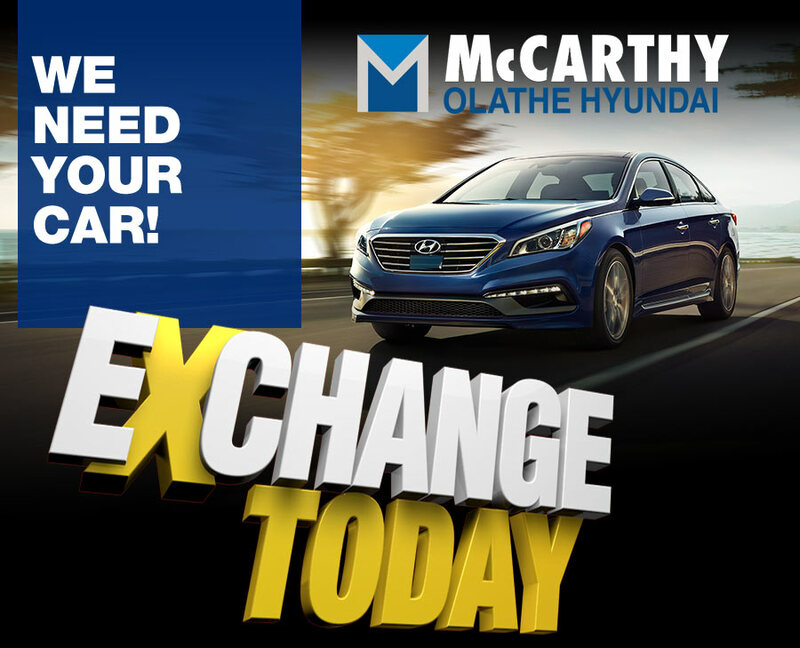 When it's time to make the switch to a new Hyundai or a nicer pre-owned vehicle, head to our car dealership in Olathe at 681 N Rawhide, and use your trade-in cash as a down payment. We've also got various Hyundai lease deals and car loan specials to keep your costs as low as possible, so be sure to speak with an expert from our Financing department before you choose your next vehicle.